The Japan Bus Pass by Willer Express can be used on overnight and daytime long distance buses on the network of Willer Express on three, five or seven days of your choice within two months from purchase. The pass can only be used by holders of non-Japanese passports. The pass can be used for up to three bus rides per day on buses operated by Willer Express. Overnight buses departing after midnight count for the previous day. The pass is not valid on premium buses with less than four seats per row. It is also not valid on buses that are offered on the Willer website but are operated by companies other than Willer. It is not allowed to travel the same route in the same direction twice on the same day (e.g. two rides from Osaka to Hiroshima). Travel on the same route but in different directions, however, is allowed (e.g. a round trip from Osaka to Hiroshima and back). The "Monday to Thursday" version of the pass cannot be used on Fridays, Saturdays, Sundays and public holidays, while the "All Day" version can be used on any weekday. Both pass versions cannot be used during certain blackout periods, such as Golden Week, Obon and the New Year holidays. Check the official website for details. The pass is valid on three, five or seven days of the pass holder's choice within two months of the date of purchase. The days do not need to be consecutive. Seat reservations are required for each ride and can be made online until one hour before departure. The pass cannot be shared between multiple travelers. Photo identification is required when boarding the bus. The pass can only be used by holders of non-Japanese passports, including foreign residents of Japan. 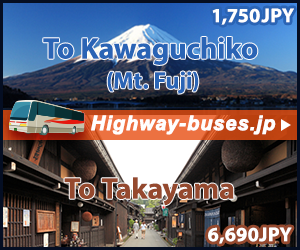 The Japan Bus Pass can be purchased online by accessing the Willer Express website from outside of Japan. Payment by most major credit cards is accepted. The Japan Bus Pass is a pass for long distance travel in Japan for budget travelers who do not mind sleeping on the bus. If used effectively, it can reduce the cost of transportation to very low levels, e.g. around 3000 yen for a trip from Tokyo to Hiroshima (a regular train ticket costs around 18,000 yen). The pass is a particularly good offer since it can be used on non-consecutive days and because overnight travel also reduces the cost for accommodation. Willer's bus network is centered around Japan's two primary urban areas (Tokyo and Osaka/Kyoto), connecting these areas with secondary cities across Japan. Therefore, the pass is a great tool for tourists who base themselves in the two primary urban areas, but it does not provide transportation between secondary cities directly and is less useful for off-the-beaten-track travel. The Japan Rail Pass is the more expensive and less flexible alternative for long distance travelers who do not like traveling overnight on buses. The rail pass has a wider area of coverage than the bus pass, and there are no blackout dates during which the pass cannot be used.